Summoner’s Rift is the most popular map in League of Legends. You can play the normal 5v5 solo, ranked, and flex queue in this map. The main goal in this map is to destroy the enemy nexus. Summoners rift is said to be located in a remote forest between Freljord and Ironspike Mountains. The place houses the greatest magical power in all of Valoran, making the area a place where individuals seek magical endeavors. This map is the largest compared to the other two main maps (Twisted Treeline and Howling Abyss.) It is diagonal in shape with three lanes in the top, middle, and bottom side of the map.There is also a river in the middle area that surrounds the two biggest monsters in the game, The Dragon and Baron Nashor. 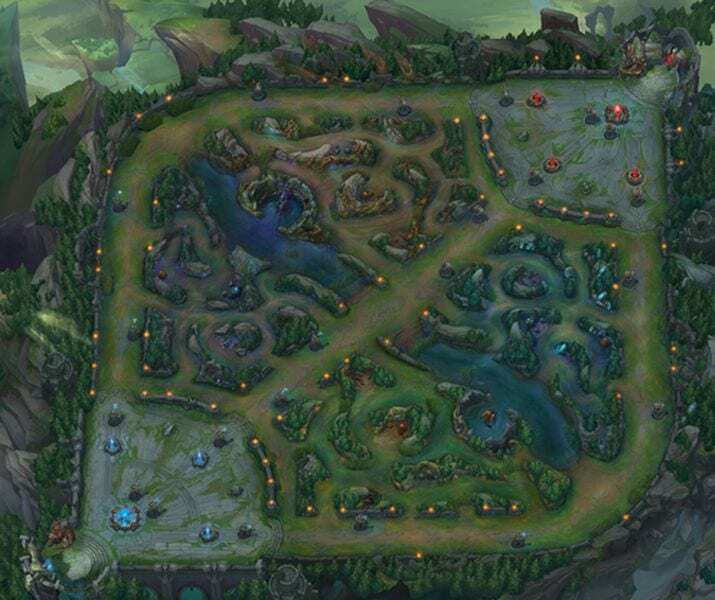 There are two opposing teams in Summoner’s Rift- The red Side in the top side of the map and the blue side on the bottom. Three turrets guard the front, middle, and back area of each lane. The Back turret is the one responsible for defending the inhibitors. There are two nexus turrets inside the base that will serve as the final defence for the nexus. A game in Summoner’s Rift usually lasts about 30-45 minutes. Summoner’s rift saw a lot of changes and temporary themes over the years. These are the winter, Autumn, Blood Moon, and arcade map. Minions and other monsters are usually changed with these temporary map updates. The overall aesthetic of the map also changes depending on the version of the map. Summoner’s Rift is covered with snow and presents can be seen throughout the map. Even Baron Nashor wears a santa hat. Summoner’s Rift changed its overall appearance last 2014. The map’s artistic style and accessibility improved, along with updated textures and improved animations. The newly-implemented practice tool is in Summoner’s Rift as well. This map provides an excellent place for team fights because of the large scope of the map. There are also choke points in the map that allows players to make flashy plays and hasty decisions on whether they must engage or not. The monsters also bestow a lot of opportunities in the game. The blue sentinel, for example, gives increased mana regeneration. These buffs can be very beneficial, especially in the early parts of the game where these buffs truly matter. There are also strategically placed brushes all around the area, and a lot of walls that players can jump through. However, some walls that are large cannot be traversed.